Hear and watch John F. Kennedy being sworn in as the thirty-fifth President of the United States and delivering his iconic inaugural speech on 20 January 1961 here. Kennedy’s inaugural address is considered among the best presidential inaugural speeches in American history. The address took 13 minutes and 42 seconds to deliver. The inauguration of John F. Kennedy as the 35th President of the United States was held on Friday, January 20, 1961 at the eastern portico of the United States Capitol in Washington, D.C.. The inauguration marked the commencement of John F. Kennedy’s only term as President and of Lyndon B. Johnson’s only term as Vice President. Kennedy died 2 years, 306 days into this term, and Johnson succeeded to the presidency. Kennedy took office following the November 1960 presidential election, in which he narrowly defeated Richard Nixon, the then–incumbent Vice President. He became the youngest person elected to the office at the age of 43. To those peoples in the huts and villages of half the globe struggling to break the bonds of mass misery, we pledge our best efforts to help them help themselves, for whatever period is required–not because the communists may be doing it, not because we seek their votes, but because it is right. to those nations who would make themselves our adversary, we offer not a pledge but a request: that both sides begin anew the quest for peace, before the dark powers of destruction unleashed by science engulf all humanity in planned or accidental self-destruction. 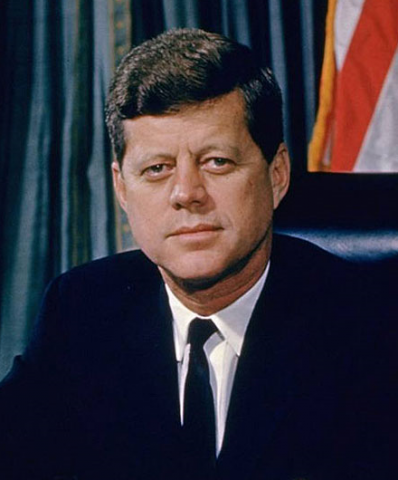 John Fitzgerald Kennedy was born on May 29, 1917 in Brookline, Mass. His parents were Rose Fitzgerald and Joseph Patrick Kennedy, Sr. He was assassinated on November 22, 1963 in while traveling with his wife, Jacqueline, Texas Governor John Connally, and Connally’s wife, Nellie, in a presidential motorcade in Dallas, Texas. 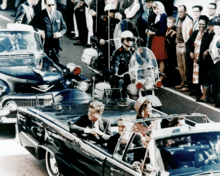 Photo below was taken shortly the assassination.